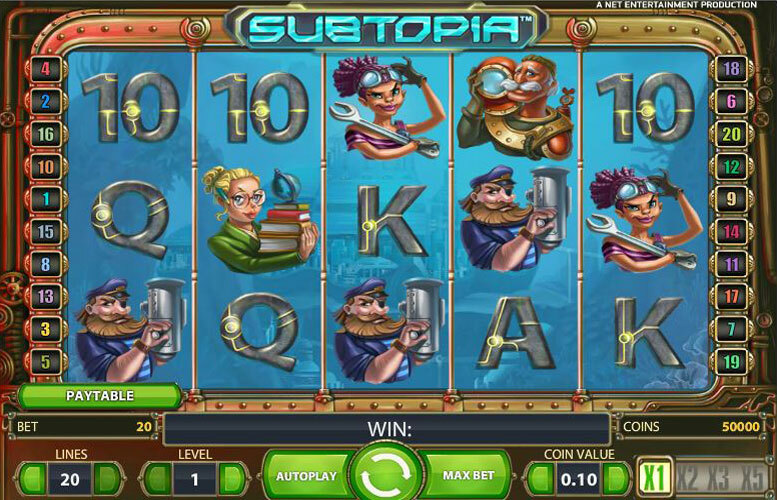 Subtopia is an under water themed slot machine with a max win of 120,000 coins per spin. It features a wild and a scatter which can trigger free spins as well as a random multiplier with each spin which can lead to x5 your winnings for no extra cost! 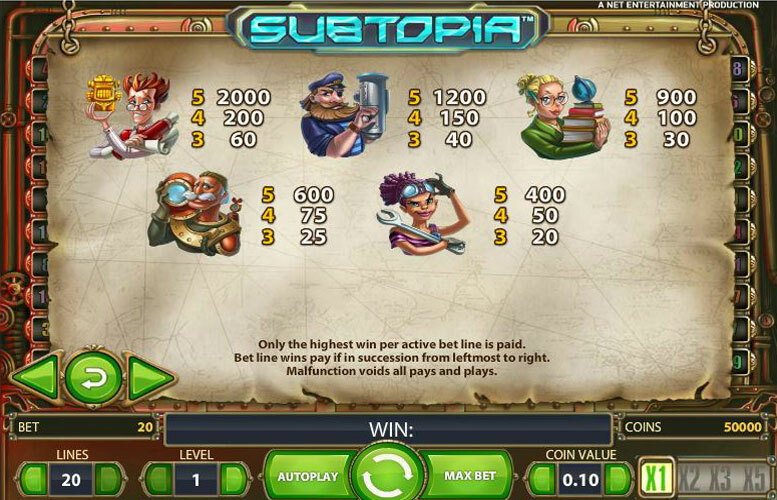 Welcome to Subtopia, the 5-reel, 20-line slots game set deep under the sea. The background is underwater and you can see a great, sprawling city on the ocean floor. The border of the playscreen and the playscreen itself is a window, assumed to be in the sub that you’re in. Subtopia has a couple of cool features; the first one that comes is the multiplier that you see on the bottom right of the screen, next to the display that shows the coin value. At random spins it moves to either 2, 3, or 5x. Any wins are multiplied by the highlighted number. This applies to all wins except for Scatter. Speaking of Scatters, 3 or more on the reels triggers free spins. Randomly appearing is a multiplier, starting at 2, then going up to 4 and 6. The number of free spins and when the multiplier moves up is completely at random. After the 6x multiplier the meter will move up to the skull-and-crossbones, which ends the free spins. Now, let’s look at the top prize available in Subtopia. The top paying symbol available in Subtopia is 2000 coins. Note that this as well as most other wins are multiplied by number of coins bet, then by coin value. So, this gives you 20,000 coins at max coins bet. You get this by getting 5 Professors on a payline. Although it’s harder to do, you can actually get 120,000 coins if you get 5 Professors at the 6x during free spins. This amounts to £60,000 of playing at the top coin value in UK pounds. Not a bad payoff at all. Now, let’s take a look at the other winning combinations in the game. First, we’ll look at the special symbols, followed by the regular. 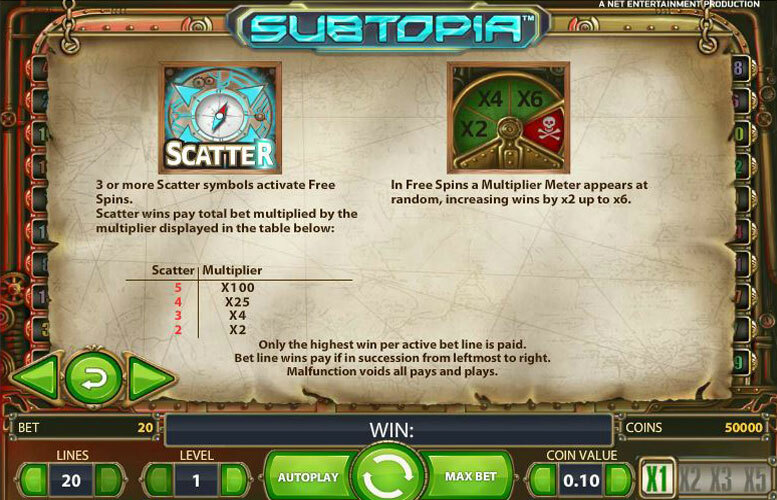 All payouts for Scatters are multiplied by total bet and are not affected by random multipliers during spins. All other wins are multiplied by coins bet, then by amount per coin. Tiki – This little Tiki man is the Wild and will substitute for all symbols except Scatter and its multiplier meter. Compass (Scatter) – If you get 5 of these on the reels, you will get 100 times your total bet, 25 times for 4, 4 times for 3, and 2 times for 2. 3 or more will start the free spins feature. Captain – This one-eyed bearded Captain is manning his periscope for payouts. He gives you 1200 if you get 5 of him on a payline and 40 for 3. Librarian – This scholarly lady with an armful of books pays out 900 for 5 on a payline and 30 for 3. Explorer – This diver in the old school suit pays out 600 for 5 on a payline and 25 for 3. Mechanic – This purple-haired lady with the monster wrench wrenches out 400 for 5 on a payline and 20 for 3. Ace – 150 is the payout for 5 on a payline and 10 is the payout for 3. King – You get 100 for 5 Kings on a payline and 7 for 3. Queen -5 Queens on a payline pays 80 and 3 Queens pays you 7. Jack – 60 is the payout for 5 on a payline and 5 is the win for 3. Ten – 5 Tens will get you 50 and 3 will get you 5. Now, let’s check out the betting limits for Subtopia. 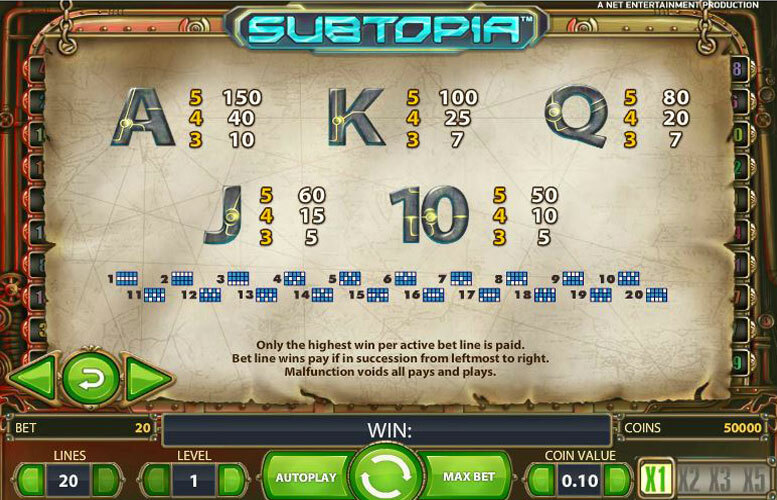 To recap, Subtopia has 20 lines and you can bet from 1-10 coins per line. You can bet 0.01, 0.02, 0.05, 0.10, 0.20, and a maximum of 0.50 per line in coin value. If you are betting all 20 lines at a rate of 10 coins per line and 0.50 per coin, your maximum bet will be £100 per spin. Overall, we enjoyed playing and testing this game. The characters are cartoon-style and maybe a little silly-looking, but that’s ok. We generally prefer the slots that have a bonus game, and that’s where Subtopia misses. However, the payouts are fairly frequent, which is always a plus, and when you activate the free spins feature you can really cash in hard. That places the game, regardless of any drawbacks it may have, in high regard, at least in our opinion. If you are a fan of submarines, underwater cities, or any other oceanic aspect, you will likely get some enjoyment out of Subtopia. The sounds of bubbles and sonar pings are pretty cool. 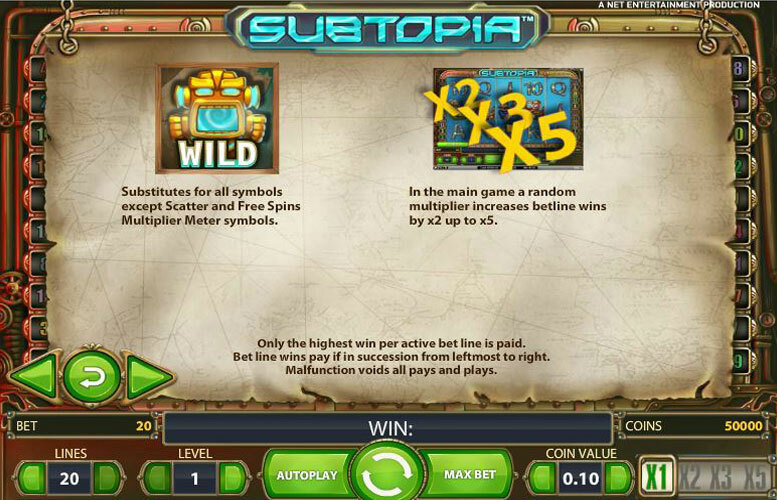 We like the random multiplier on a spin and the progressive multipliers during the free spins, which is what makes Subtopia unique from any of the other slot. Down periscope, have fun and as always, good luck! This game has a rating of 4 / 5 with 542 total reviews by the users.